With a background in security and international development, Jennifer Savidge brings a wealth of knowledge to the WPS Network. She is a gender specialist in the fields of international development and security, with experience implementing programming across a range of sectors at the grassroots and institutional level. Jennifer’s interest in WPS-related issues developed during her time spent completing a Bachelor’s degree in Political Science at McGill University and a Master of Applied Communications at Royal Roads University. Joining the naval reserve in high school, she became a member of the Canadian navy and served in a range of roles. Her overseas deployments included serving as part of NATO’s stabilization force in Bosnia and Herzegovina and participating in counter-terrorism operations in the Mediterranean Sea and counter-piracy operations in the Indian Ocean. In 2016, Jennifer was appointed as a gender advisor with the Canadian Armed Forces, one of the first such advisory roles to exist within the CAF. Through her work as a gender advisor, she was introduced to the WPSN-C and became a member upon her release from the CAF. From her diverse experiences, Jennifer says she has learned the importance of imparting the human rights aspects of gender when addressing gender-related issues within organizations, and that the approach needs to be context-specific. She notes that a careful balance needs to be struck between focusing on human rights and operational effectiveness in the peace and security fields in particular. Jennifer is also an author. Published in 2013, her creative non-fiction book Hostile Seas details her experiences aboard a Canadian naval vessel tasked with escorting merchant ships off the coast of Somalia while under the threat of piracy. by Olivia Adams, MA Candidate (NPSIA) and intern with The WPS Group. Mary Scott has always been involved in gender issues and women’s rights. As a resident of Winnipeg, she worked at the Manitoba office for Human Resources Development Canada, seeing first hand the needs of the community. At HRDC, she managed the Manitoba Stay in School program, which focused on youth drop-out rates, especially indigenous youth; she developed a Women Returning to Work program, centered around the skills women needed to re-enter the workforce; and finally, she put on a program called Alice in Cyberland, which provided workshops for women about the internet and computers, an important initiative in 1980s Manitoba. Still, it wasn’t until the year of her retirement that she became interested in the global women’s movement. In 1995, Mary attended the 4th World Conference on Women in Beijing as an official delegate. At the conference, she began to see the importance of women’s activism and of women’s involvement in peace negotiations. She tells the story of the famous UN conference “peace tent,” where women came together from different perspectives to respectfully share dialogue on issues such as reproductive health. She came away from this conference with a deeper understanding of the global effects of gender inequality around the world, and of what women were doing to make a difference. Victoria Tait is an accomplished academic in the field of women, peace and security. Victoria completed both her Bachelor’s and Master’s degrees at Queen’s University in Political Science. Despite always having an interest in women’s studies, gender issues and warfare, it was not until reaching a graduate level that she became involved in feminist security studies as a distinct area of research. During her Master’s degree, her supervisor was completing project work on asymmetric engagement in modern warfare, a project to which Victoria saw an opportunity to apply a feminist perspective for her thesis. After beginning interviews with female-identified soldiers, she found the subject fascinating and has stuck with the WPS subject area ever since. As a current Ph.D. candidate at Carleton University, Victoria’s dissertation encompasses studying how international feminist norms are interpreted and communicated to domestic militaries. On a Canadian level, she is specifically researching how the UN Security Council Resolution 1325 has been understood by various elements of the Canadian security apparatus and how that understanding has been communicated to and responded to by Canadian soldiers. Her research has pointed to the continued exclusion of women from military roles, a limiting factor for women to participate in what is considered an “essential” citizenship activity in many democratic countries. Upon completing her Ph.D., Victoria says she hopes to stay within the field of women, peace and security, whether within an academic, governmental or private consultation position. She notes that her main goal is to work to help women enter into key decision making positions in the security sector. After spending time researching and working on women, peace and security, Victoria says that work still needs to be done within the field itself in order to reach full potential for meaningful conversation. This includes: growing the relationship between feminist scholars and building a strengthened cross-institutional support network. She is currently working on a collaborative project with Dr. Maya Eichler and Walter Callaghan on the gendered experiences of Canadian veteran transition from military to civilian life. Carole Doucet has been working in the field of women’s rights and gender equality for over 20 years. She has had a plethora of experiences, including being an international policy advisor, strategic manager, researcher, trainer, and advocate specializing in women’s rights, gender, peace and security issues. She has advised both governments (especially in Africa) and international organizations, including but not limited to UN Women, NATO, the Canadian International Development Agency (CIDA), the UN Department of Political Affairs, the UN Department of Peacekeeping Operations, the Kofi Annan International Peacekeeping Centre, and multiple civil society and women’s organizations. While her work initially started in developing countries, she has recently been working in post conflict countries supporting the implementation of the Women, Peace and Security (WPS) agenda. Carole has served as the senior gender advisor for the UN Peacekeeping Mission in Liberia (2008-2011), the UN Department of Peacekeeping Operations in New York (2013-2015), and the Office of the UN Special Envoy for the Democratic Republic of Congo and the Great Lakes region (2016-2017). She has most recently finished a consultancy for NATO, helping the Alliance work on their WPS action plan and their performance indicators. Carole has recently taken on the position of Director of the Conduct and Discipline Team with the UN Stabilization Mission in the Democratic Republic of the Congo or MONUSCO. Based in Goma, Carole’s mandate will be to advise senior leadership on the application of UN standards of conduct in the Mission including the Zero Tolerance Policy on sexual exploitation and abuse. She’s learned a lot from women’s rights defenders and activists around the world and their courage. They have different approaches, new ways of seeing things, and effective designs. She is consistently humbled by this, and hopes to continue learning from other inspiring women (and men) in the field. On August 31, 2018, the Women, Peace and Security Network – Canada (WPSN-C) released their latest publication, reflecting on and critically reviewing the latest Canadian National Action Plan on Women, Peace and Security (the C-NAP). The publication, Women, Peace and Security in the Age of Feminist Foreign Policy: Reflections on Canada’s New National Action Plan, explores the long-awaited second iteration of the C-NAP, as the first expired in March of 2016. Since then, Canada has engaged with feminist issues, including the Women, Peace and Security Agenda, on the national and international stage many times: with the International Assistance Review, the House of Commons Standing Committee on Foreign Affairs and International Development, and the Defence Policy Review. Not to mention the political attention paid to feminism through Prime Minister Trudeau’s Liberal government raising the concept and approach as a necessity in Canada and on the world stage. The publication recognizes the great strides that have been taken between the first iteration and the second C-NAP, noting how it demonstrates a more sophisticated analysis, situated in feminist academic literature and the global feminist foreign policy discussion, exploring the links between security, gender inequalities and women’s rights. 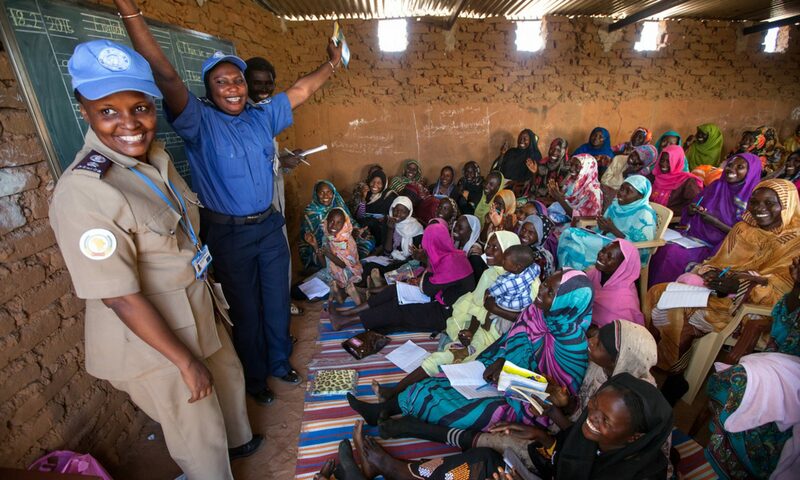 Yet the authors also recognize that key issues are lacking in the new C-NAP, and remain unacknowledged: there are concerns regarding overall policy coherence, reporting and implementation capabilities, whether lessons have been learned from specific country and industry contexts, and the lack of targeted budgets for women, peace and security. With the new C-NAP, the development of a new Action Plan Advisory Group, co-chaired by the WPSN-C, has been formalized to hold the Canadian government accountable on its WPS initiatives. In support of this new relationship, this publication aims to contribute critical and knowledgeable analysis, and carry the discussion forward as Canada focuses on the implementation of its new C-NAP and the first progress report expected in September.